With age comes wisdom, but it also comes with questions about your changing dental care needs. Uncover all of the answers you need to keep your smile healthy. Can I get braces as a senior? Yes. Braces are now popular with people of every age who want to improve the appearance or function of their teeth. Ask your dental clinic to recommend an orthodontist who specializes in dental care for seniors. What should I do if my dentures are no longer comfortable? This is a rather common and affordable dental care problem to correct with a simple adjustment at your dental clinic. It’s actually very normal for your gums and jaw to develop and change over time. As a result, your dentures may start to feel much looser. If you’re facing this problem, make an appointment with an affordable dentistry expert immediately. Are dental implants a smart alternative to dentures? Dental implants offer a more permanent alternative to dentures. 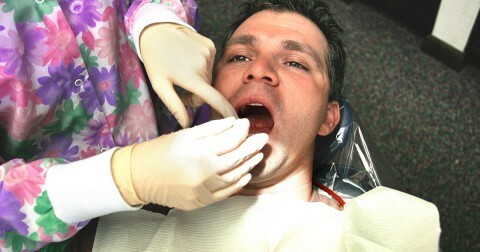 They have an artificial tooth root that is implanted into the jaw to firmly hold a tooth or bridge. When it comes to dental care for seniors, dental implants are now becoming more popular than dentures. They are ideal if you have healthy gums, but have lost teeth over time. But they’re not right for everyone, so talk to an affordable dentistry expert to see if dental implants are the right choice for you. What does it mean if my teeth start to tingle when exposed to hot and cold temperatures? It means you have sensitive teeth. This occurs when the gums start to pull away from the teeth, exposing the delicate root of the tooth. When the root comes into contact with hot or cold temperatures, you may feel a stinging sensation. Fortunately, this is an affordable dental care issue that is often resolved by using a toothpaste designed for sensitive teeth. If this doesn’t help, ask your dental clinic about other affordable dentistry solutions. You may be able to have a seal placed over the sensitive roots of your tooth to keep this pain away. Everything just went great the staff was friendly and helpful and the doctor was very nice as well .